An in-demand charity has launched a £1m campaign to help it provide 24-hour medical care by 2020. 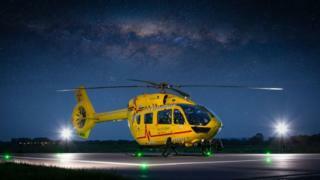 The East Anglian Air Ambulance (EAAA) operates 365 days a year but there is no service between midnight and 07:00. Becoming a round-the-clock helicopter emergency medical service (HEMS) provider will cost the Norwich-based charity an extra £1m a year. EAAA's operations director Matthew Jones said the move will allow it to treat 600 more patients a year. The charity also serves Suffolk, Cambridgeshire and Bedfordshire. Currently, there is no HEMS provision in Norfolk but a year-long overnight trial with the East of England Ambulance Service Trust (EEAST) found there was a huge demand for it. In that time, a rapid response vehicle (RRV) was called to attend 220 emergencies where critical care was required but unavailable. Mr Jones said that people across East Anglia will benefit from the charity becoming a 24/7 service and urged people to donate to the campaign. He said: "Patient care is at the heart of everything we do. If we can be there for 600 more people each year, then this is a great step forward for us."